Few horses that can boast such a comprehensive CV as 30-year-old Bobby, the 14.3hh skewbald who was recently crowned the Veteran Horse Society's in-hand champion at Olympia. The Helme family's much-loved gelding started his ridden career competing in endurance with Becci Elme, who then passed over the reins to her younger sister Donna (now Kenyon). Lexington, KY - The United States Equestrian Federation (USEF) is pleased to announce Kelsey Kimbler as the 2010 Junior Equestrian of the Year. This highest of honor offered to a junior equestrian comes on the heels of another big honor Kelsey earned earlier this month - the 2010 USEF Youth Sportsman's Award, sponsored by Breyer Animal Creations. This puts Kelsey in elite company, as one of only a handful of junior equestrians to accomplish both feats in the same year. "My sister Kirsten won this award in 2007 and I've always looked up to her. When she won, I decided 'That's my next goal!'" Kimbler related. "It has been a whirlwind experience." The 17-year-old high school senior has shown an unwavering commitment to her sport. As a young child, she started in the show ring with walk-trot. Soon after, she continued her riding with endurance and has never looked back. Kimbler has won the AERC Junior National Hundred Mile Award twice in its four years of existence. This award is given to the junior rider who completes the most 100-mile rides in one year. Kimbler holds the record for being the only junior to complete five such endurance rides in one year. She also has represented the AHA Youth Association as her region's delegate and through involvement in 4-H events with her Arabians. She was nominated by both the Arabian Horse Association (AHA) and the American Endurance Ride Conference (AERC). Her commitment does not stop with her horses, and as Kimbler can attest, she's used to balancing quite a hectic schedule. She tested for the first professional level in ballet in the fall, and hopes to teach younger children, to fund her college education. In addition, she is a member of the Keystone National Honor Society which requires her to complete 30 hours of community service along with maintaining at least a 4.0 grade point average. She is also an active member of her school's cross-country team and Students Against Destructive Decisions club (SADD). Kimbler plans to attend university near home next year, pursuing a degree in biology. 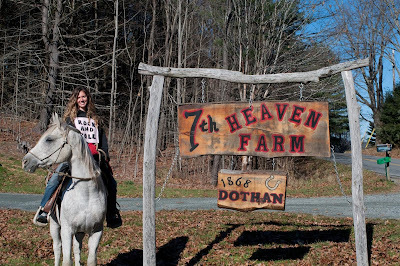 While other future plans aren't yet set in stone, she's already sure of one thing: horses. The Ruth O'Keefe Meredith Trophy was established in 1985 to honor a junior equestrian who has made outstanding contributions to equestrian competition while exemplifying exceptional talent, sportsmanship and dedication. After reviewing the many candidates nominated for one of the USEF's highest honors, the Awards Committee selected the young equestrian who exceeded the demanding qualification criteria. To qualify, a young equestrian must have competed at USEF-recognized shows over the past year while displaying good sportsmanship and integrity. The winner is also someone who has excelled and has willingly given back to their sport. Kimbler will be honored during the 2010 Pegasus Awards on January 22 in Lexington, KY, as part of the 2011 USEF Annual Meeting. She was nominated by both the Arabian Horse Associaton (AHA) and the American Endurance Ride Conference (AERC). For tickets to the 2011 USEF Annual Meeting and Pegasus Awards in Lexington, KY, visit www.usef.org and click on "2010 Annual Meeting" on the right side of the homepage. For more information about the 2010 USEF Junior Equestrian of the Year, contact Trisha Watkins, USEF's Awards Manager, at (859) 225-6944 or tlwatkins@usef.org. United States Equestrian Foundation (USEF) and The EQUUS Foundation have launched America's Favorite Equestrian campaign. Designed as an interactive fundraising effort, the unique program is designed to raise funds for equestrian sport on an annual basis. It relies on donations made via mobile texting through any cellphone or handheld mobile device. Each $5 donation made between December 15, 2010 and February 28, 2011 is considered a vote. 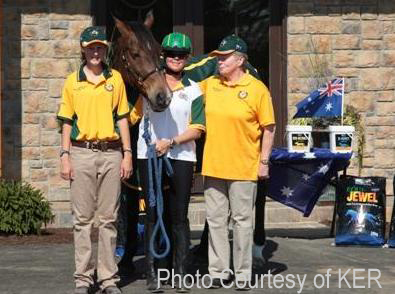 A minimum of $10,000 in sport welfare grants will be awarded based on the donations made via this campaign, and an additional $5,000 grant will be made to the equestrian discilpline that generates the most votes. Eight equestrian disciplines are listed, and within each discipline, between six and eight people are vying for your vote. The disciplines are dressage, driving, endurance, eventing, jumping, para-dressage, reining, and vaulting. Each of these disciplines were represented at the recent World Equestrian Games in Lexington, Kentucky. EasyCare is well represented in the Endurance discipline. 2009 AERC Hall of Fame Recipient Dave Rabe and EasyCare's own President & CEO, Garrett Ford, are two of the eight nominees. "I'm humbled to be in the company of such fine ambassadors of our sport. To be included in a list of equestrians that includes Julie Suhr and Becky Grand Hart is a great honor," said Ford. "I'm obviously delighted that two of the eight Endurance nominees are representing Easyboot, but this also represents an opportunity for the broader sport of endurance to receive new funds regardless of the representative you vote for." “It is our goal to bring recognition to all the equestrian disciplines and breeds, and to inspire all equestrians to support our overall efforts on behalf of horses. We hope this program will generate excitement and involvement for horse lovers everywhere,” said Lynn Coakley, President of The EQUUS Foundation. The EQUUS Foundation is dedicated to securing homes and useful lives for all horses - competitively, recreationally and therapeutically - and to educating the public on the important role horses have in our everyday lives. In the short time since the Foundation’s establishment, over $1.5 million in grants has been awarded to horse and equestrian charities across the United States. Visit the link at http://www.equusfoundation.org/afe.php. Select your favorite equestrian listed under each discipline and follow the instructions provided. After texting your vote, you must reply YES to confirm your vote/$5 donation. Each donation is 100% tax deductible. If you want to cast more than six $5 votes in a single month ($30), simply follow the instructions listed on each equestrian profile. A credit card is required. Fans can vote for their favorite equestrians from among a slate of international athletes until Februray 28, 2011. The winners will be the athletes from each discipline with the most votes. The winners will be announced in March, 2011. For more information on America's Favorite Equestrian Campaign, contact The EQUUS Foundation, Inc., at 168 Long Lots Road, Westport, CT 06880 (203) 259-1550, equus@equusfoundation.org, website: www.equusfoundation.org. For more information on Easyboots, please see the EasyCare website at http://easycareinc.com and the EasyCare blog at http://blog.easycareinc.com . For all additional questions, contact Kevin Myers, Director of Marketing at kmyers@easycareinc.com. In another of our "Performance of the year" stories, Matthew Dale catches up with a man who provided one of the year's highlights with his amazing race in Kona. Keep those e-mails coming to kevin@ironman.com - we'll be posting some of those here on the site tomorrow. Still functioning? Uh, yeah. In October, Hollander finished the Ford Ironman World Championship for the 21st time (out of 21 starts), jogging down Alii Drive well ahead of the midnight deadline, coming home in 15 hours, 48 minutes. Four weeks later he completed the 70.3 world champs in Clearwater. Warning. Warning. Another foolish question. “Do you want to spend a day with me?” Hollander told the man. Watching the 2004 movie "Hidalgo" changed Keith Kibler's life. The movie told the story of the hardships endured by a cowboy, portrayed by Viggo Mortensen, and his horse, Hidalgo, during a long distance race across the North African desert. The movie inspired him to take up the sport of endurance horse racing. "I had done over 80 triathlons and had accomplished about what I wanted to accomplish at that," Kibler said. "I thought I'd take a year off from punishing myself at that and spend some time with my wife and her horses. "What really appeared to me was the relationship between the cowboy and his horse. I thought it would be fun to compete at something where you had more of a relationship than with your bike." So, after a bit of research, Kibler decided to give endurance racing a shot. Immediately, he discovered there was another parallel between the movie and real life. In the movie, Mortensen rode an American mustang, a horse that many believed unsuited to the rigors of a long-distance race. Kibler, and his wife, Sandy, compete on Tennessee Walking Horses and Missouri Foxtrotters. Most endurance racers ride Arabians. "I showed up at my first race, a 50-mile race, in May of 2005 and was told I was on the wrong kind of horse and should go home," he said. "They asked if I could really sit on a horse for 50 miles. An ironman is about 140 miles, so I thought I could. I had just completed my second one of those, and didn't know if I wanted to do that any more." The races are sanctioned by the American Endurance Ride Conference. About 92-93 percent of the competitors ride Arabians, a fact that piqued Kibler's curiosity. "It made me wonder whether a gaited horse could do endurance," he said. "And, that's what I sought to find out. I used both the training techniques and training tools from my triathlon background to train the horse because I didn't know any better. Not only did it work, but it worked very well." There is a real advantage to riding the gaited horses. "To ride an Arabian horse for 50 of 100 miles, you have to have really strong legs and a strong back because you're jumping up and down," Kibler said. "Our horses are so smooth you don't have to do that. The saddles we use are cushioned. The one my wife has has a webbing in it. It's kind of like riding in an easy chair." The Kiblers race nine different horses. In their five years they've had 47 races, 29 top-10 finishes and five best of condition awards. "The best of condition award is the top honor in this sport," Kibler said. "It's a combination of where you place, the weight of the rider and how the veterinarians have scored the horses before the race, at each vet stop, at the end of the race and an hour after the race." The presence of veterinarians is where real life deviates from the movie. At the end of Hidalgo, viewers weren't sure the horse would survive. The horses are monitored carefully in AERC events. "Usually for a 50-mile race you'll have a stop at about 20 miles and another at 35 miles," Kibler said. "They're like pit stops in NASCAR, but they're vet stops. The vets check the horses. It's a very safe sport for the horses. You have 30 minutes for the horse's heart rate to drop. If it doesn't drop in time, you're disqualified. They watch the horses very carefully. "The motto of the AERC is ‘To finish is to win.' You have to get it done (50-mile race) in 12 hours. That includes the vet stop time, and the vet stop time is around an hour. Your moving time is about 10 hours." He said a top caliber horse can average about 12.5 miles per hour in a 50-mile race. The nearest AERC races are held in Salem. For more information on the sport, or gaited horses, go to www.shawneesunrisefarm.net. Horse lover Helen Koehler, of Levy County, was recently rewarded for her on-going contributions to the trail systems in the area at the 20th National Trails Awards symposium held in Chattanooga, Tennessee in November. The award "recognizes an individual that has demonstrated outstanding contributions and provided consistent support for trail planning, development, or maintenance." A horse enthusiast since the 1980’s, she purchased her first horse and began enjoying trail riding and horse camping. This interest evolved into volunteering on various trail projects, as well as, serving on local land-use committees in the Gainesville area. She moved to Levy County in 1995 with her husband Buck and together, they have marked over 100 miles of shared use trails. Additionally, they annually host the Goethe Challenge endurance ride which raises money for the Forest. In her spare time, Koehler also serves as the Trail Grants Program Liaison for the American Endurance Riding Conference, chairs the Levy County Tourist Development Council, is president of The Goethe Trail, Inc., which promotes nature based equine tourism and actively participates on Florida’s Recreational Trails Program Committee. Last February, the American Horse Council released its first Report on Equestrian Access on Federal Land. The 2009 report provided a brief overview of the responses the AHC received from equestrians to its ongoing access survey in 2009. The report can be viewed and downloaded on the Recreation Issues page on the AHC website. 2011 is set to be a busy year for the Tamworth & District Endurance Club, backing up after a busy 2010 running 2 x 80km rides and the Quilty. The year will start early with an 80km Endurance Ride and 40km Training Ride being held at the Australian Equine and Livestock Events Centre (AELEC) in Tamworth. The club was approached by the Arabian Horse Society to run a ride in conjunction with their National Championship to showcase Endurance. Please note that the holding of this ride all depends on a suitable and appropriate course being available. The ride base and camping will be at AELEC which boasts the best Equine facilities in the country. The camping fee has been kept to a minimum with the support of the Arabian Horse Society. AELEC was opened in 2009 and the TDEC were involved in this, running an Endurance Demonstration in the Arena and manning an information booth. The Centre is a $30 million World Class Venue which has hosted many championship events to date a covers a massive 42 hectares. This will be a fantastic opportunity to showcase Endurance Riding to the rest of the Arabian Horse World and the general public. It is also a great chance to check out this amazing facility and the Arabian Horse Society event. The Arabian Horse Society has been extremely supportive in getting the Endurance Ride as part of their championships, and we hope to have Riders and Horses who attend will create a lasting and positive impression of the sport of Endurance Riding. Further information can be found at www.aelec.com.au or www.ahsa.asn.au. The second event on the TDEC calendar will be the inaugural Manilla Muster. This will be a 3-day marathon ride and also an 80km ride on the final day of the marathon. Full details about this ride will be revealed soon. Finally, the third and final event will be the Bendemeer Endurance Ride which is normally held in May. This has been moved to September and will take full advantage of the beautiful spring weather that the tablelands has to offer. For information about any of these events, please call Jeff or Gay Bonham on (02) 67852055. Terre O’Brennan has made an outstanding contribution to horse sport, Endurance riding in particular, rising through the years to become the most respected Endurance rider in BC and one of Canada’s top riders. She started riding in the early 1980’s on her first pony Cavvie in Endurance moving up to her current mount Koszaar. The pair were recently named as alternates for the 2010 WEG team. Terre isn’t just a determined and clever rider she also spends countless hours giving back to the horse sport. She is one of the original members and a current Director of the Endurance Riders Association of BC as well as an Affiliate director of Horse Council BC. implementing a points and mileage tracking system and annual awards. Terre is a dedicated, hard working individual that continues to demonstrate a commitment to the sport of Endurance not only as an Ambassador, but as a competitor, Ride Manager and mentor to new riders coming into the sport. Her chosen sport may be relatively obscure but thanks to an award from the Horse Council of B.C., Kelowna equestrian endurance rider Gail Jewell is hoping to keep pushing the sport of endurance riding into the main stream. The Horse Council of B.C. named Jewell its athlete of the year at the 30th annual awards banquet late last month in Abbotsford. Wendy received a standing ovation from members at the recent Awards Dinner when she was presented with the awards - her input to Endurance has been greatly appreciated over the years. I was delighted that Wendy Dunham, in being awarded not one but two, ‘Unsung Hero’ trophies at the Awards Dinner, at last got the recognition she so highly deserves for all the hard work she has done for EnduranceGB before and since its formation in 2001.The standing ovation that she got from those present at the AGM Dinner showed how well her input has been appreciated. ABBY Chisholm from Lydford was awarded the top national award for a Young Rider at the Endurance GB National awards evening held in Daventry. Abby, aged 15 on her 13.2hh PB Arab pony CFS Diana of Court, beat some of the top national young riders in the country by having the most points awarded for her top 10 rides over the year. Beginning with the 2011 ride year the North American Trail Ride Conference (NATRC) will allow in competition all hoof boots designed for sole protection, including those that have attached straps, keepers, or gaiters, as long as these attachment devices do not extend above the pastern. The NATRC is the governing body for the sport of competitive trail riding. The National Board of Directors voted the rule change in at their Nov. 13. board meeting in Denver, Colo. The restriction of having no hoof protection that extended above the coronet has long been a controversy within the organization especially since technology has progressed, offering an increasing amount of hoof boot options and designs that achieve more effective and reliable fit. "There have been many recent advances in hoof protection technology," says Laurie DiNatale, the executive administrator for NATRC. "Previously the only hoof boots that were allowed in competition were those that did not cover or come above the coronary band. The new rule will give riders more of a choice in hoof protection during competition." According to the NATRC, the organization's board of directors, judges committee, veterinarians, and other officials worked over recent years to make a rule that was right for the organization now and in the future. The wording was thought out very carefully, as well as wording for other rules impacted by this change. Leg protection, such as bell boots or wraps, is still not permitted. These changes will give riders more choices for hoof protection. Judges may, and are encouraged to, check for fit and adjustment as well as rubs or chafes under any boot or its attachment. Horseback riders weaved their way through 155 miles of trails on the Fort Ord Public Lands on Thanksgiving weekend during the fifth annual Desert Gold Pioneer I, II, III endurance ride. "The horses love it here with the rolling hills, natural grass and friendly people," said Tracy Hofstrand, chief steward of the race, referring to the hikers and mountain bikers who shared the trails with riders in the race. "This really is the perfect place for multiple disciplines and sports." Riders chose to cover 90 miles (30 miles each day) or 155 miles (first day 55, second and third days 50 miles each) during the three-day event. While many riders stayed at a base camp at the old Fort Ord Travel Camp, others rented rooms at local lodgings. Hofstrand said the Monterey area's many hotels and attractions provide extra comforts that aren't always available at endurance races. After riders finish the day's race, they can enjoy tourist attractions, such as the Monterey Bay Aquarium, and a hot shower at a hotel. "It's a great trail to ride," said Lindsay Graham, who is also a member of the U.S. Endurance Team. "These kinds of rides with multiple days are fun, 'cause after you take care of your horse for the day, you can have a glass of wine and kick back by the fireplace." Representing New Zealand is becoming a bit of a family affair in the Higgins household. This time it isn't shooter Phillip wearing the silver fern. Instead, it is wife Alison's turn to do the nation proud. On Sunday, she and their horse Twynham El Omar will line up in the 160km endurance race at the World Equestrian Games in Kentucky. The Nelson-based combination will be one of three Kiwi combos on the starting line. But it was Phillip who started Omar, breaking him in and riding him for the first three years. As a shooter, Phillip represented New Zealand at both world championship and world cup level. These days, he's happier grooming for his wife in her bid for glory. Omar is the third of the late Leo Nisbett's horses to represent New Zealand at world championship level. In the hands of Alison, he won the 2010 100-mile South Island Championship. She's got no qualms about the world games race she faces this week, but says that starting line will be something else. "We're used to 1am starts, when everyone is calm – we'll be in a pack with 130 or so others. It's going to be tough." Sept. 22--Imagine hosting a party on scale so grand you'll need to ask a neighbor to open his yard for your party. And another neighbor, and another and ... . The endurance race -- essentially a long-distance race in which the rider must pace the horse so that it remains fit to finish -- will begin and end at the Kentucky Horse Park, but it is the one WEG competition whose course will extend beyond the park. Originally, 65 landowners gave permission to use their property. That proved to be a bit much logistically, so Ross "just drove around all the time" and came up with a more precise route. Still, it's the largest course on private land to be used in a World Championship, according to Ross. "It's a pretty neat trail," he said. "The big thing is the relationships I've had with the landowners and farm owners..."